Good news. Casting #23 is a candidate for machining, and casting #24 may also be a candidate. Attachments 1 through 5 are pictures of casting #23. 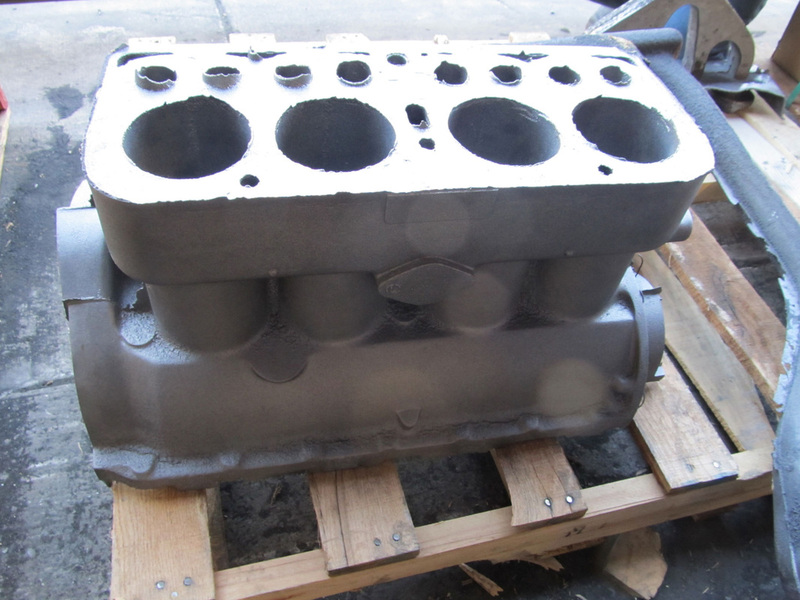 The last update was on 25 Aug 2012 with 21 castings poured. Since then, 3 additional castings have been poured bringing the total to 24. 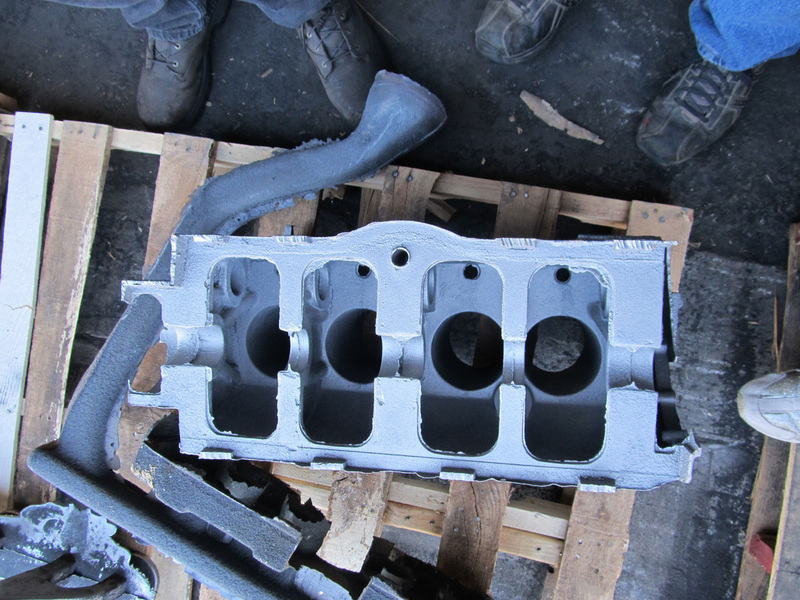 As explained in the Aug update, castings #1 through #20 were poured with a horizontal parting line and they all had varying degrees of porosity at the last to fill area (the surface where the intake and exhaust manifolds mount to the cylinder block). Also explained in the Aug update, casting #21 was poured with a vertical parting line (cylinders vertical). The mold for casting #21 was assembled horizontally, clamped together, and then the mold was rotated 90 degrees with a forklift before pouring. 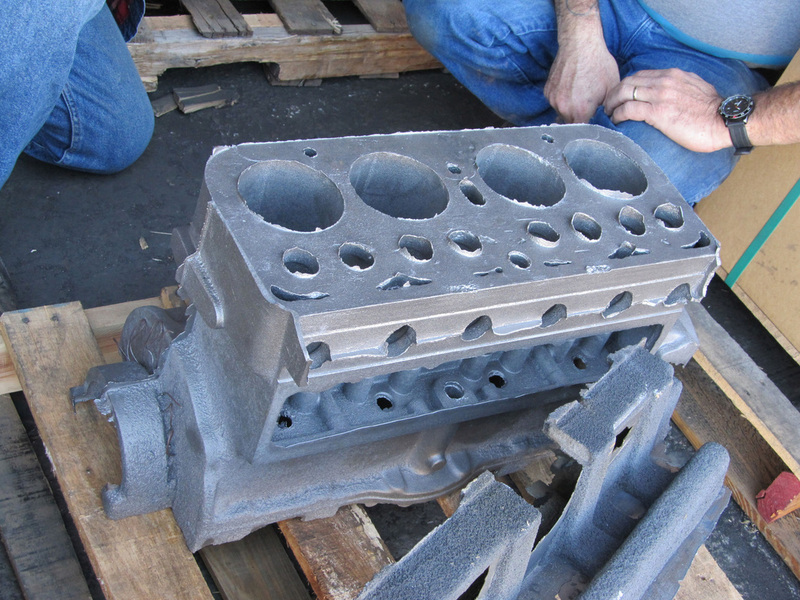 Although casting #21 had core shift, there was no evidence of porosity. After casting #21, changes were made to the patterns to convert them to have a vertical parting line during pouring. Attachments in the Aug update showed these changes. Casting #22 was aborted during pour because one of the chain binders holding the mold closed came off during rotation from horizontal to vertical and was not noticed. This resulted in a small quantity of hot iron on the foundry floor. 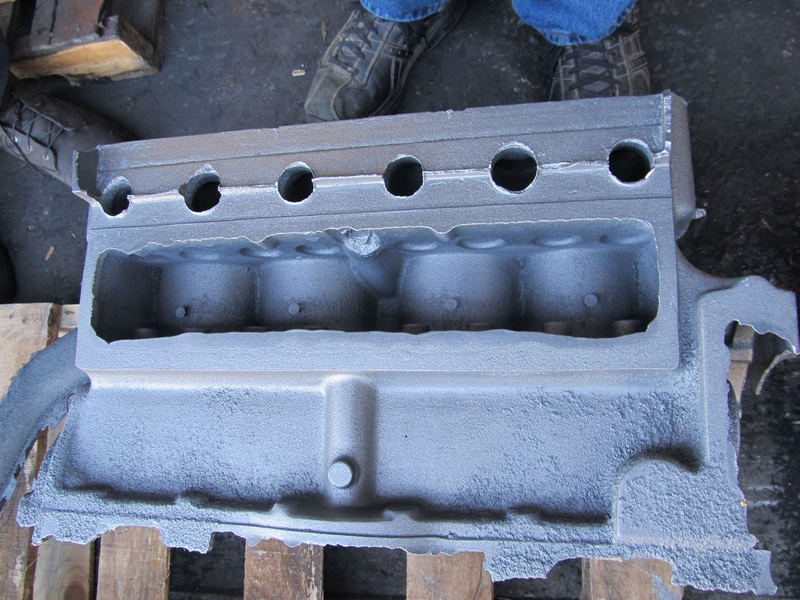 Casting #23 has all cores in position, and there is no evidence of out-gassing porosity. It does have a couple of places where there is shrinkage porosity. 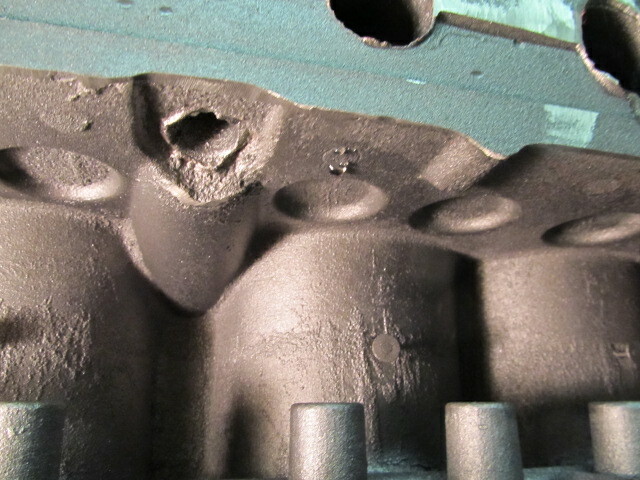 Shrinkage porosity is not visible and can be fixed by sealing the casting. 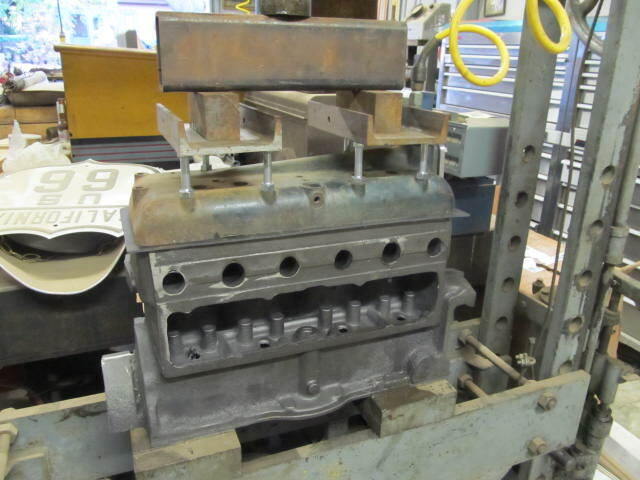 Like casting #21, the exterior of casting #23 is not cosmetically pretty since it was an engineering experiment. The shrinkage porosity in casting #23 showed up after the water jacket was filled with water, and then pressurized with air to 30 PSI. Attachment 6 shows casting #23 being pressure tested. Attachment #7 shows a drop of water that is ready to drip. Location of the drip is where a chaplet was placed to maintain wall thickness between the water jacket and the valve chamber. 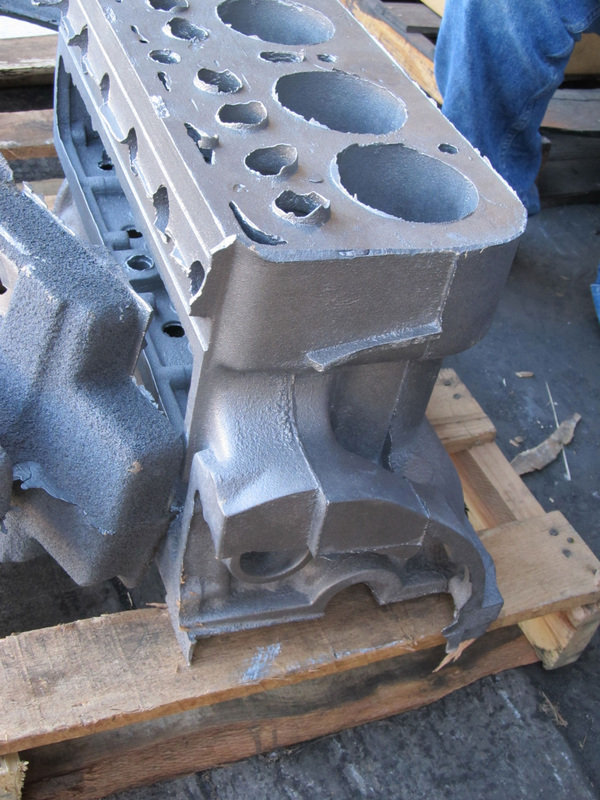 Casting porosity caused by shrinkage is a common defect in castings, and many industries seal every casting as a part of the manufacturing process. Castings are sealed with an impregnation process as follows: 1) The casting is placed in a chamber, 2) A vacuum draws all of the air out of the chamber, 3) The chamber is filled with the impregnating liquid, 4) The chamber is pressurized to 100 PSI, 5) The chamber is drained, and 6) The impregnating liquid is cured. I spoke with Mike Keller (sales manager) at Lodi Iron Works on Nov. 14, 2012 and learned that casting #24 was poured and appears to be good. Mike and I agreed that I need to take possession of casting #24 and pressure check the water jacket as was done on casting #23 to check for porosity. There have been two personnel changes at Lodi Iron Works that may have an effect on this project. Barron Gage, sales manager, retired on Nov. 1, 2012, and Mike Keller is the new sales manager. Mike Frank, manufacturing manager at the iron foundry where the cylinder block is being cast, is trading places with George who was the manufacturing manager at Lodi Iron Works steel foundry which is located in another city. In my phone conversation with Mike Keller on Nov. 14, casting #24 was made under the supervision of Mike Frank, and the new manufacturing manager, George was not present. My big concern now is that the procedure for making and assembling cores and the mold is out of date, and there will be a learning curve for George. I need to thank Mike Frank for thinking “outside the box” and rotating the parting line from horizontal to vertical. Barron was my single point of contact with Lodi Iron Works, and I need to thank him for mitigating many of my comments and suggestions. The next step is to have the casting machined. I am patiently waiting for Lodi Iron Works to produce a few good castings in a row before I commit to having the SolidWorks machined model converted to machine language for a Mazak with pallets or equivalent.